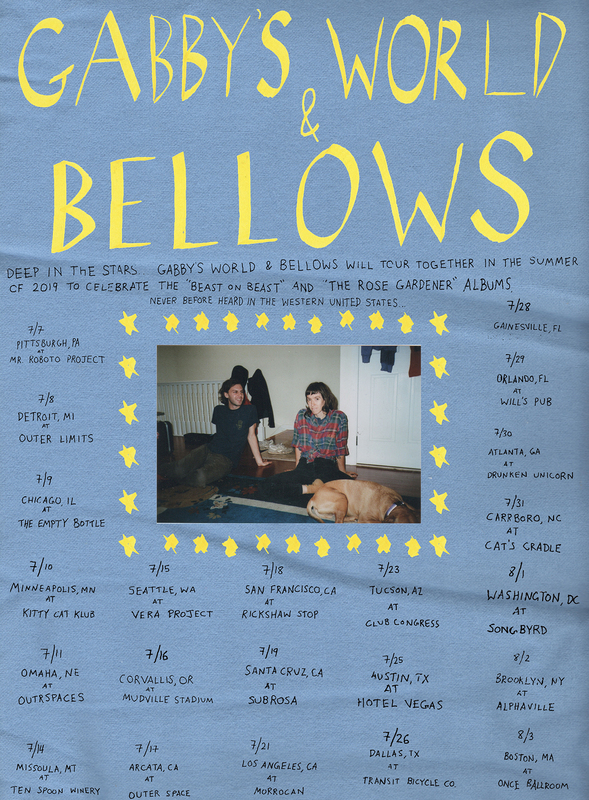 The pop-inclined bedroom recording project Bellows will be on an extensive tour this summer with frequent collaborators Gabby's World. The two Brooklyn-based groups don't often make it out to the west coast, so if you're near the Pacific it's a rare chance to catch these two amazing bands. Check the dates below to make sure you'll be able to witness songs from the recently released The Rose Gardener preformed live with a full band. July 26, 2019 - Dallas, TX @ Transit Bicycle Co.
Today we're elated to share a small release from Baltimore's Us and Us Only, aptly titled Two Songs. » Stream it everywhere and anywhere today, and read more about the special release below. In avoidance of keeping quiet ahead of their next LP, 2019’s Two Songs shows Us and Us Only occupying a space touched upon on their 2017 album, Full Flower, with an alternate, more atmospheric cut of “My Mouth.” This take trades the original version's undeniable grooves for warm distortion, old Casio keyboards, and simplistically programmed beats. Listeners may hear something akin to Smog taking a shot at Under the Western Freeway-era Grandaddy. Two Songs also features a remix of “Veiled / Forming” by White Wreath (Han Offman of High Bloom). The song, initially conceived to be more Jon Brion than Burial, is given a soft-industrial makeover fit for the first signs of Spring. If Full Flower was the band’s best impression of waking up to (and running out of) a house on fire, grabbing what means the most to them on the way out, Two Songs is coming home to see what’s left in the mess of it all. While on their recent tour through the US, Elephant Gym graced the Audiotree Live studio with an absolutely dizzying performance. The session shows the trio's talents in full bloom, featuring a setlist that spans the band's entire catalog, starting off with the agile and unpredictable title track from their most recent record, Underwater. Watch the whole performance and interview below, or save it for later on your favorite streaming platform. 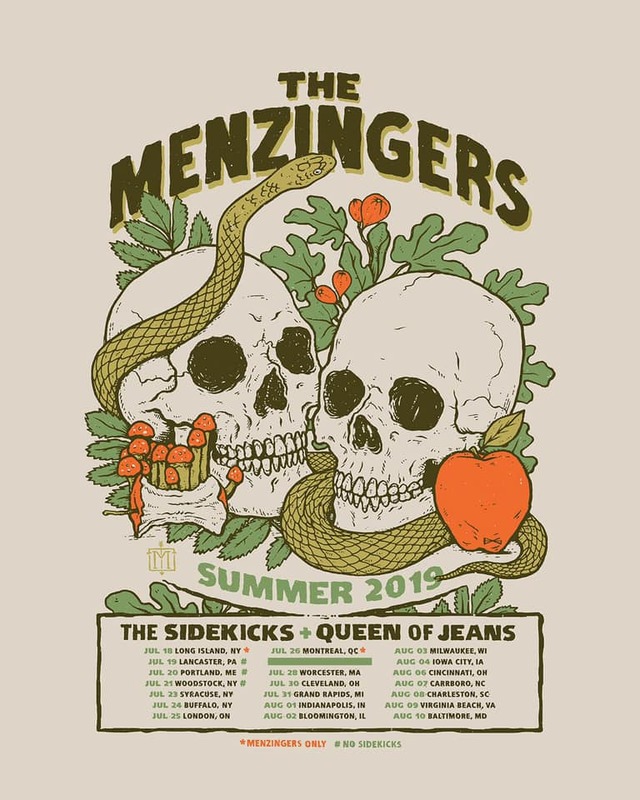 Philly-based Queen of Jeans will enchant audiences this summer with their signature crockpot-pop sound in support of The Menzingers. The Sidekicks will also share their talents for the majority of the dates. No Vacation is ecstatic to share the long-awaited official music video for their song "Yam Yam," directed by BOREDOM. The video is constructed of UHD Digital, Super 8mm Film, and features over 1,000 frames of HandPainted Watercolor Animation. Through a minimally rich color palette, BOREDOM explored the yin and yang of the modern life emotional experience, the happy and the sad. The group will also be touring extensively this summer, kicking off the season with a full US tour. The group Okey Dokey will be touring along in support. Make sure to stay tuned for more special news from No Vacation in the coming months! We're bringing our official showcase back to Cheer Up Charlie's this year with our most eclectic lineup to date. The night will open with a stripped down set from Bellows, who are currently touring on their recently released record, The Rose Gardener. 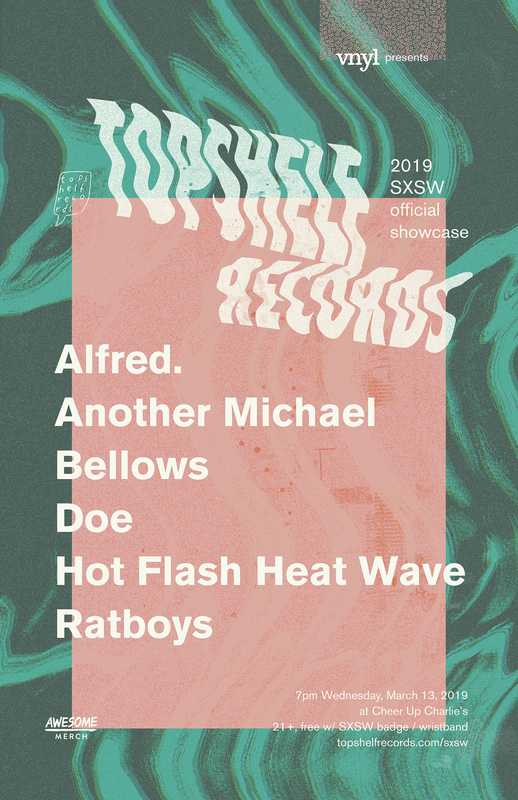 Performances from Another Michael, Alfred., Hot Flash Heat Wave, and Doe will follow before Ratboys close the night with their signature energetic set. Our showcase is presented by vnyl and Awesome Merchandise. Perfectionist pop quartet Another Michael will be hitting the road this May with the ever charming neo-folk auteur Field Medic. The run is short and limited to the Northeast, but if you're in the area we highly recommend checking out Another Michael's captivating blend of indie rock layered with the arresting and beautiful vocal stylings of the eponymous Michael Doherty. 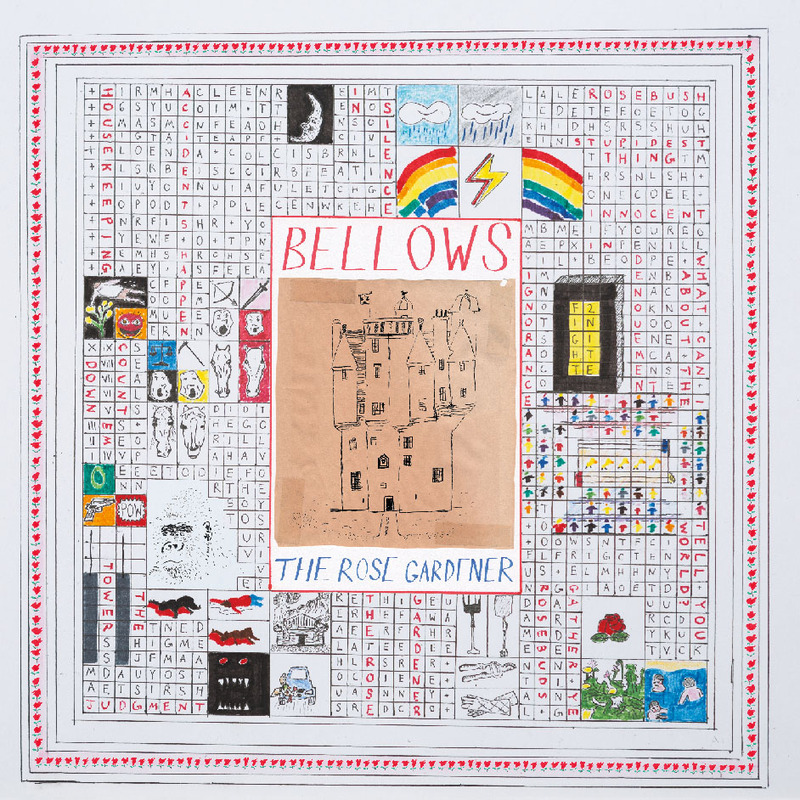 The Rose Gardener is the fourth album by Bellows. 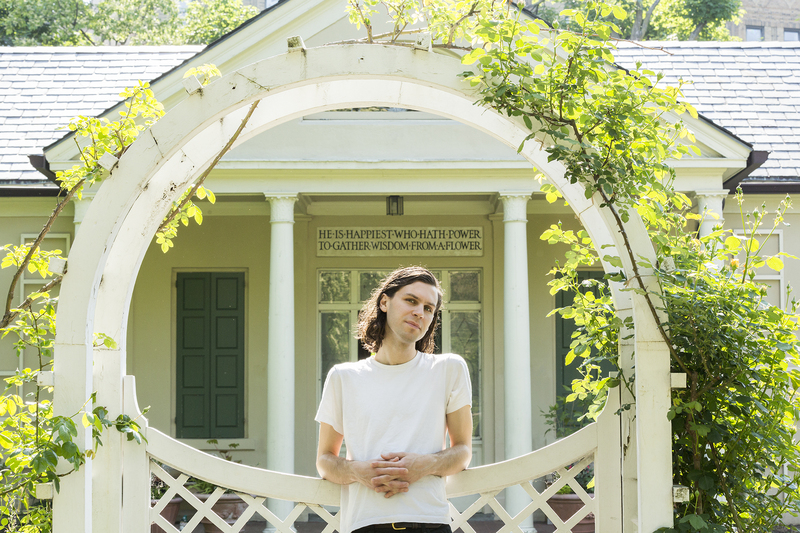 It was written by Oliver Kalb and recorded in a home studio in Woodstock, NY in early 2018. Listen to the record today on your favorite platform, and check out the tour dates below to see if Bellows is coming through your town. If physical media is your jam, please visit our store to peruse our wares. 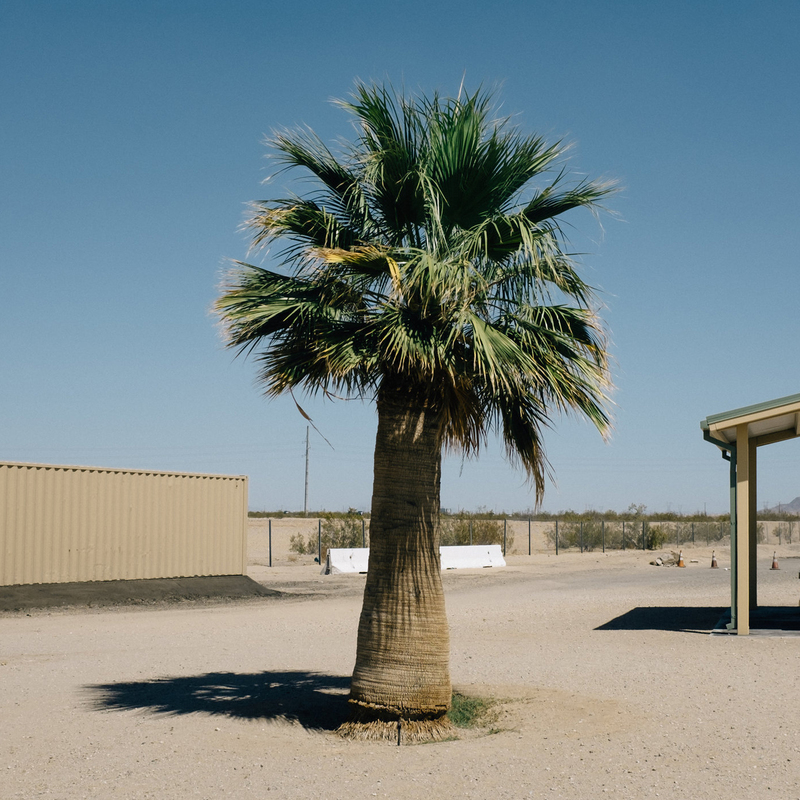 Below Kalb explains the processes and circumstances that gave life to the ambitious record, describing a series of reevaluations of relationships and personal values, eventually culminating in a refusal to succumb to the turmoil of our moment. "A lot of the album is about the idea of judgment: why we’re compelled to judge each other, hate our peers, bring competitiveness to art-making, compare ourselves to others, destroy beautiful things for an ego-boost or a feeling of political purity. The album was written in a period of intense frustration with the world of music and the dumb infighting that dominates it. Especially after the election in 2016, I found myself more and more demoralized with the state of the world. As America sunk deeply into quasi-fascism and normalized day-to-day violence, I began to wonder why our counter-cultures were paralyzed and unable to respond, so wrapped up in the narcissism of small differences that they forgot to fight the actual bad guys. Somehow the idea of judgment felt crucial to understanding the moment we’re living in. Everyone in society the judge, the rockstar, the lead of his own private TV show, privately declaring judgment and dismissal to anyone standing in his way. I began to feel the loneliness of this moment in history. That although we’re supposedly more connected than we’ve ever been, we’ve become further and further factionalized until each person stands completely alone, unable to forge real connections or bonds, isolated within the internet booth of judgment and narcissistic self-righteousness. I think the loneliness I see in this moment became the metaphor of The Rose Gardener — a gardener trying to tend to a single rosebush in the dead of winter. I imagined this character and his practice of tending to a rose that seems destined to perish in ice, who recognizes the futility of the work but nevertheless goes out every day to tend to the dying plant. The loneliness of this character felt akin to the feeling of trying to make art in such a loaded and violent moment. How could one possibly try to speak softly in a world filled with such deafening shouting from all sides? But rather than giving up gardening, the Rose Gardener persists — he sticks his hands into the thorny rose bush and tries to see through to what might still lie on the other side: real life." 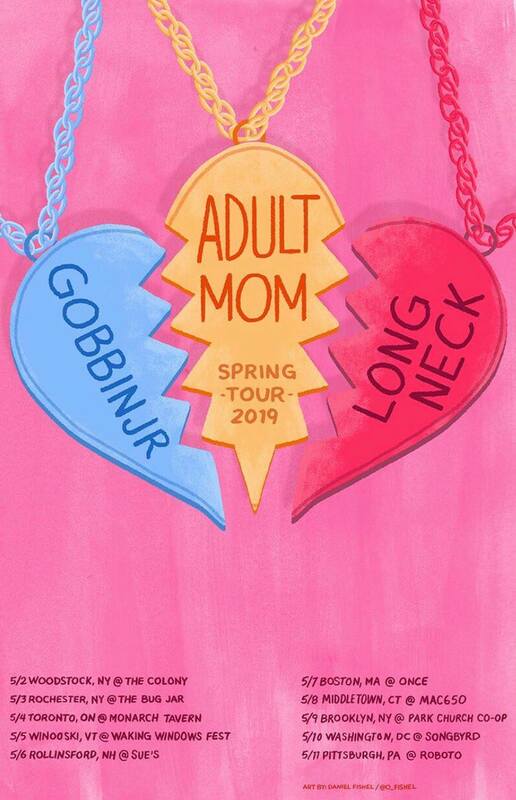 gobbinjr will showcase their ever whimsical, savvy brand of pop throughout the northeast this spring on a short tour with Adult Mom and Long Neck. First Listen // Bellows - "The Tower"
"The Tower" is the fifth and final single to be shared before the release of The Rose Gardener, the forthcoming full length record by Bellows. Stream it here a day ahead of its full release on all your favorite digital and streaming platforms, and read about the track below. The Rose Gardener will be released on February 22, 2019. "'The Tower' is partially based on an interpolation of the song 'WTF' by Gabby's World, the other band I'm in," says Oliver Kalb of the penultimate track from his forthcoming record The Rose Gardener. "Those first lines are about the experience of hearing 'WTF' and having a memory of the power of touring in a band and singing someone else's beautiful songs night after night. In a moment of extreme chaos and conflict in my life, the context and meaning of the song changed for me. It suddenly felt like a rallying cry to stick with music despite it feeling like a hopeless endeavor: 'I will not back down.'" Though not an expert in tarot, Kalb concedes that the title is a reference to the tarot card of the same name. "The Tower in tarot symbolizes upheaval and change; the image on the card is literally a tower being struck by lightning. We build up towers of worldly ambition and narcissistic insistence on our own constructed images of ourselves. These towers of careerist striving, however, are built on faulty foundations – we have to destroy the towers we build up if we really want to change ourselves, or get out of the ruts we're in." Kalb explains further that the triumphant and hopeful song "is a declaration of defiance against a seemingly insurmountable obstacle, the recognition that although everything in my life seemed to be crumbling away, that nevertheless making art and continuing to live my life despite hardship was the most important thing. But that realization came with a caveat: that if I was going to continue with art, I needed to fundamentally change myself, and my relationship to having a life in music. 'Deep in the stars, or wherever you are, I need to find you' – these final lines, sung in the same pitched register as the quotation from 'WTF' are about the universality of music, how hiding somewhere deep in the universe is a primal force we can sometimes tap into to create beauty, and to rise above the pettiness of earthly experience. Art is the only thing that connects us to something higher than ourselves, and I need to live life in search of something greater than me." The Rose Gardener is out via Topshelf Records on February 22, 2019.